Manifesta 12’s The Planetary Garden. Cultivating Coexistence, which opened on June 16 in Palermo, Sicily, is a sprawling and at times fragmented series of venues and events. But unlike other art and architecture biennials whose main purpose is to deliver trends, Manifesta 12 is the real thing. 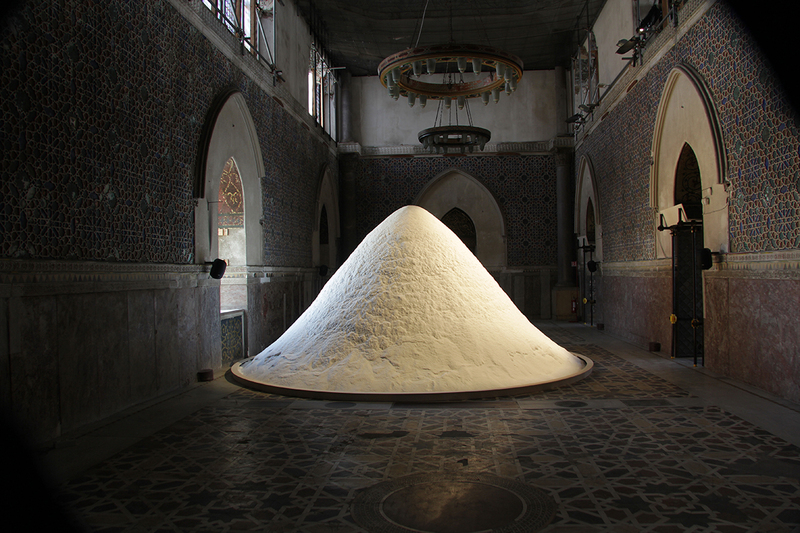 This is an exhibition that’s been hardwired into the city’s fabric, and while undeniably the city of Palermo completely upstages the Manifesta exhibition, this must have been the prime intention of the curatorial team from the start. Manifesta 12 is Palermo, and therefore the exhibition is a diagram to explore the city and to discover some of the most fascinating and haunting architectural spaces anywhere in the European-Mediterranean region. It is precisely this urban-based formula that the Dutch-based Manifesta “franchise” is best known for, and therefore the impressive success of this exhibition has much to do with the way the curators have been able to weave their fertile themes into the city’s fabric. There is art, there is architecture, and there is the city. Given how much there would be to cover in a review of this size, I will try to present some of the biennial’s bolder highlights. Much of the credit for Manifesta’s achievements is thanks to OMA’s partner Ippolito Pestellini Laparelli who led the curatorial team. Laparelli succeeds in cracking Palermo’s urban code, precisely because he trains his lens on Palermo’s convoluted urban fabric, its magnificent cardo and decumanus, the overgrown gardens, the abandoned urban masterplans, and melancholic housing estates. This is especially true of the city and its dramatic relationship to its old town, one of the largest historic city centers in Europe. And yet this impressive segment of the city lies in some kind of lethargic black hole when compared with the adjacent districts of Palermo that grew in the thirties and then expanded exponentially in the sixties. The one constant is the draw of the periphery, which serves as the cash cow for the city’s black economy while the old town lies in neglect and disrepair—a condition the city continued to submit to well into the nineties. 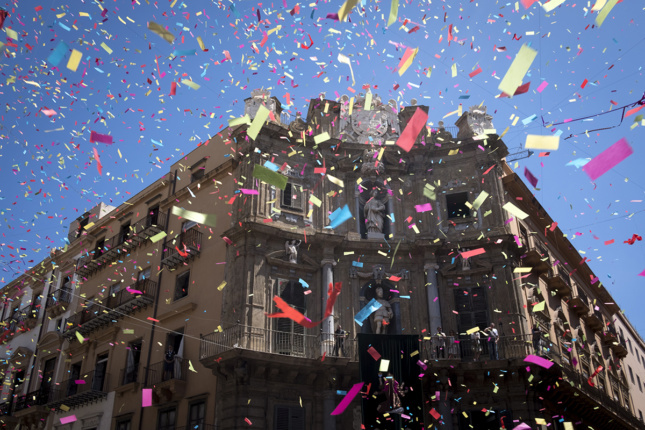 In order to better comprehend where Palermo was headed, Manifesta enlisted politicians, local associations, patrons of the arts, and institutions to suggest ways to engage the city, to establish new routes of access, and to generate new kinds of cultural experiences. 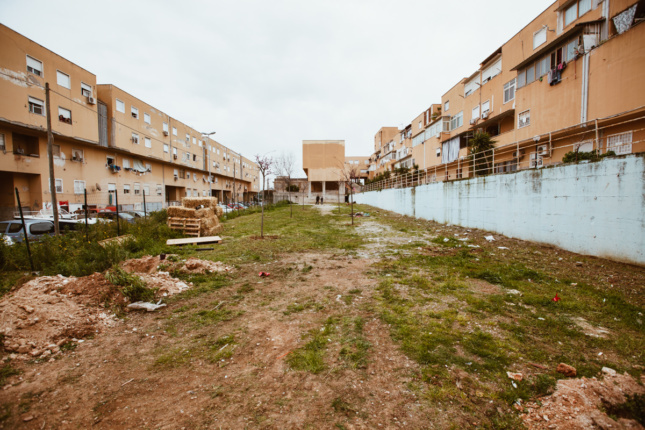 By and large, it’s a project that has pervaded into different levels of society, and it’s not uncommon on the streets to hear locals discuss Manifesta’s merits or problems. 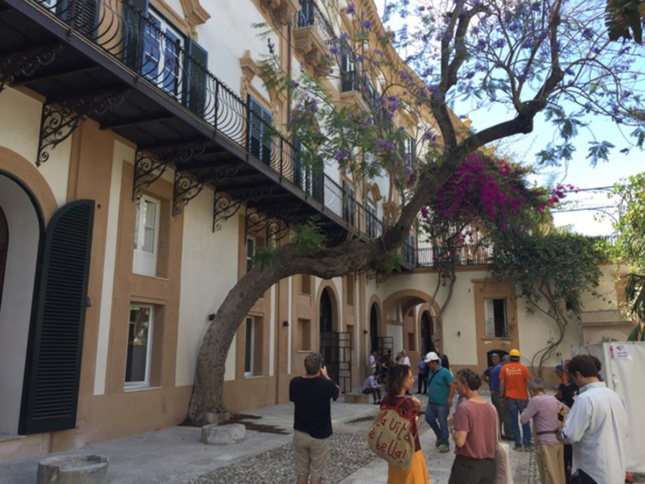 And there are viable results: Massimo Valsecchi and his wife Francesca have made it their mission to restore the magnificent Palazzo Butera in the heart of the city. Valsecchi, whom I spoke with during Manifesta’s opening, saw the renovation of Palazzo Butera as a stopgap measure, a way to decisively reengage the city’s historic axis by reasserting the building’s role as both palatial seawall and monumental gateway to the ancient city. For what turns out to be the price of a single Gerhard Richter painting, the purchase of Palazzo Butera by these important Lombard contemporary art collectors could impact the city’s future. 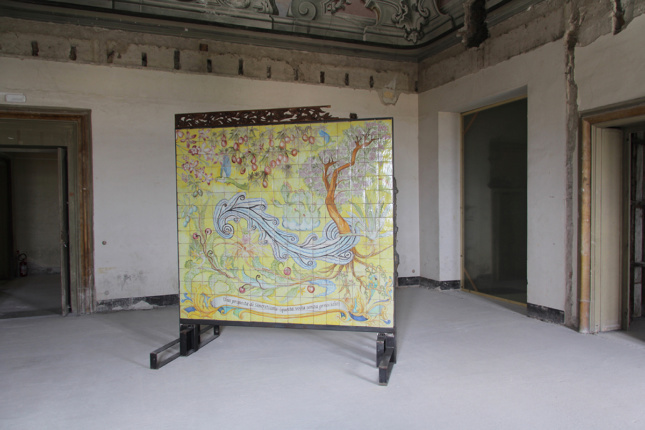 But for now, the palace’s impressive interior renovation, in preserved ruin style, frames Manifesta’s verdant exhibition Garden of Flows. Not far from Palazzo Butera one can enter the historic Botanical Gardens, another destination in the procession of Garden of Flows, to become entangled in the rhizomatic plant cultivations. Much of the same could be said about another architectural monument, Palazzo Forcella de Seta, an old bastion with a casino built above it from the 17th century. It’s aligned perpendicularly with the seafront and is just as mesmerizing a stage for this exhibition. This Moorish-influenced venue is one of the spaces around the city that are assembled together and are “Out of Control,” along with the Palazzo Ajutamicristo where we are confronted with projects investigating different conditions on immigration, data, and identity. There are projects by Forensic Architecture’s offshoot, Forensic Oceanography, where they investigate the militarized control of the Mediterranean, and Tania Bruguera’s look at the Mobile User Objective System, known as MUOS, the cordoned off American base in southeastern Sicily directing remote drone warfare. But it’s the urban conundrum that remains most compelling, and beyond the layers of 16th, 17th, and 18th century buildings, streetscapes, and gardens. There is also a ponderous stratum of Fascist-era buildings, many in near states of abandon, but all intriguing for what they once represented in the time of Fascistization when Sicily’s mafia was subjugated and Mussolini’s regime added its symbolic stamp to the island. One building in particular, the Casa del Mutilato, stands out for its unfinished beauty and troublesome iconography. Designed by the architect Giuseppe Spatrisano in 1939, the modern rationalist style building remains surprisingly intact with most of its original statues, icons, murals, furniture, and memorabilia. Inside its main interior hall is Cristina Lucas’s Unending Lightning, a mapping of the long and fatal history of aerial bombing. There’s also an intervention by Alessandro Petti’s “De-colonizing Architecture” developed by the students attending the Royal Institute of Art in Stockholm. 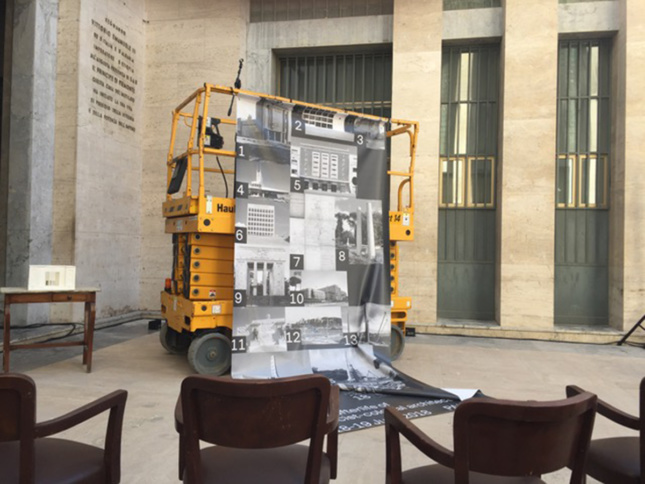 Their workshop and symposium, “The Afterlife of Colonial-Fascist Architecture,” featured a scissor lift that extended up into the open dome of the central courtyard, inserted there to disrupt the building’s regimented spatial order. When I asked Petti about their intentions, he responded by saying: “With the re-emergence of today’s fascist ideologies in Europe–and the arrival of populations from north and east Africa–we have had to ask ourselves: how do the material traces of the Italian empire today acquire different meanings in the context of migration from the ex-colonies?” This point is especially onerous because not much inside this building has changed since its opening, and the building still features the original Fascist era maps of Eritrea, Ethiopia, and Somalia. But it doesn’t end here. Post-war Palermo continues to be fraught with good architectural intentions gone sour. Nothing encapsulates this urban dilemma more than ZEN (Zona Espansione Nord), a public housing expanse from the late sixties designed by Vittorio Gregotti with a team that included Franco Purini. Like many of these largescale mass housing projects built from this era, ZEN’s reputation belies its origins. According to an interview with Purini from 1998, the strength of this project was in its desire to replicate regional territorial characteristics, specifically the fenced citrus groves found all around the area. Purini, who would go on to develop the master plan for earthquake-devastated Nuovo Gibellina, recalled Gregotti’s close relationship with the Sicilian publisher Sellerio, who sought to ground Gregotti in the island’s local building culture, which resulted in the project’s unusual compactness. Evidently, the project stripped of its amenities was doomed to failure. But here is where Gilles Clément, author of The Third Landscape and guru behind Manifesta’s Planetary Garden concept, is making a significant comeback, precisely in these original disaffected groves. 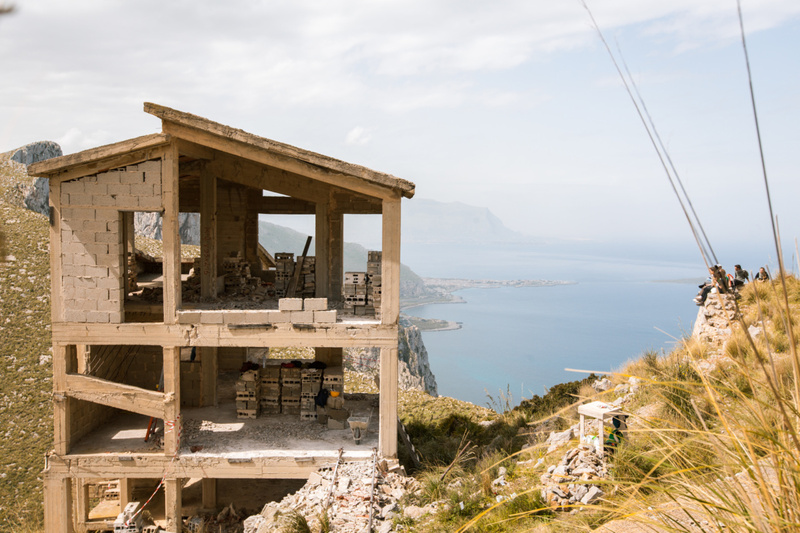 To get the perfect overview of Palermo, one can make his or her way up to the top of the peak Pizzo Sella, where the group Rotor has transformed one of the many unfinished and illegal private homes, basically a concrete frame into a spectacular viewing platform. Manifesta 12 is worth the time and the space. Some might worry it prefigures a wave of gentrification that will certainly kill all that is so enchanting about this city: the entropic streets and gardens, the ruined palaces, the many multi-cultural public spaces, polyvalent cuisines, and the sublime beauty of the city. But I don’t think so, or not just yet given the unusual political direction the city is taking under its current mayor. Leoluca Orlando, a veteran of previous campaigns against the Mafia, sees a bright future for the city in welcoming new immigrants. Palermo should not be considered a European peripheral city, but rather the center of the greater Mediterranean region: Sicily is at the crossroads of Africa, the Middle East, and the Ionian islands with a centuries-old history of multi-ethnicism and multi-culturalism. I see Palermo as an alternative model for living, outside the tired economies and nationalistic concerns of an older Europe. It will be interesting to see if Manifesta 13 will keep this kind of critical edge when it lands in Marseille in 2020. Manifesta 12’s The Planetary Garden. Cultivating Coexistence is curated by Ippolito Pestellini Laparelli, Mirjam Varadinis, Andrés Jaque, Bregtje van der Haak and is on view through November 4.